On the night of November 9, 1938, Hitler's Nazis burned synagogues all over Germany and Austria, smashed shop windows, looted stores, ransacked Jewish homes, and killed dozens of Jews. Twenty thousand Jews were arrested. 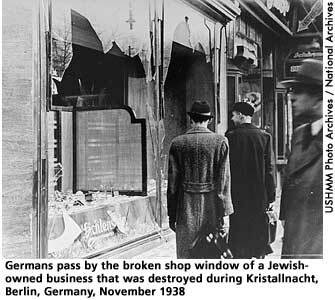 The event was called Kristallnacht (Crystal Night) because of the piles of broken glass strewn on the sidewalks and streets. Two days later, the German government imposed an "atonement fine" of a billion marks on the Jews to pay for the property damage and, several weeks after that, announced that Jewish assets would be confiscated. A few days later, the government forbade Jews to drive cars or use public transportation, visit public parks and museums, or attend plays or concerts. It was a prelude to the horrors of the Nazi concentration camps to come and is often considered the beginning of the Holocaust. ER was appalled. "This German-Jewish business makes me sick," she wrote to her friend Lorena Hickok on November 14, 1938, "and when FDR called tonight I was glad to know that [U.S. ambassador to Germany Hugh] Wilson was being recalled and we were protesting. "(1) Without directly challenging American immigration policy, she said at a press conference, that "special and speedy relief methods" were needed to meet the refugee crisis in Europe. (2) When she learned that the Lancaster, Pennsylvania, country club that she was to address would not allow Jewish members, she cancelled her speech and criticized its discriminatory policy. She also intensified her work with nongovernmental organizations and individuals to find safe havens for refugees. On December 6, 1938, she spoke at a rally organized to raise funds for the Leon Blum colony being established in Palestine for 1,000 Jewish refugee families. She pressed the State Department to respond to individual appeals, advocated liberalization of the immigration laws, and worked with officials to combat American anti-Semitism. FDR recalled the American ambassador, Hugh Wilson, in protest, and no American ambassador was ever sent again to Hitler's Germany. In addition, he extended the visas of the 12-15,000 German and Austrian citizens living in the United States. Blanche Wiesen Cook, Eleanor Roosevelt, Volume Two, 1933-38 (New York: Viking, 1999), 557. Cook, Blanche Wiesen. Eleanor Roosevelt, Volume Two, 1933-38. New York: Viking, 1999, 556-562.